My review copy: Review copy bought by me. No one messes with my family. In that moment, I realize it doesn’t matter that I’ve felt like I’m still on the edge of this place. These people took me in. If nothing else, I’m indebted. Mab is hiding something. And I have a terrible feeling that her secret will get us all killed. Faeries live off dreams. Why do you think faerie tales exist in the first place? After all, if Disney taught me anything, it’s that love can’t be forced through magic. Thank you Aladdin. "Entire civilizations have been destroyed for less. Religion, ideology, love." He looks at me, a wild glint in his eyes. "Love is usually the one everyone feels is worth dying for." He’s lying. But why? Why would he like to me? I thought he was on my side. Now I’m wondering if that was the biggest lie of all. I was a little disappointed in The Immortal Circus. I had heard such good things about it and I was ready to jump into the story and be blown away! I was not. It was a unique story and I love that it was run by Queen Mab herself. The circus has been around for quite sometime and participants are required to sign a rather binding contract. The story is rather interesting as it begins with the death of one of the contortionists. Something that should be impossible as these contracts render them immortal. Vivienne is the new girl, in charge of cotton candy, but cannot remember anything about her life prior to the circus. She is pretty welcome by all those involved, but becomes closest to Melody and Kingston, whom she has a crush on. Kahler did a wonderful job of creating this world that lives among us. The characters we meet have interesting back stories and different reasons for joining the circus that help to create this eclectic group of circus folk. 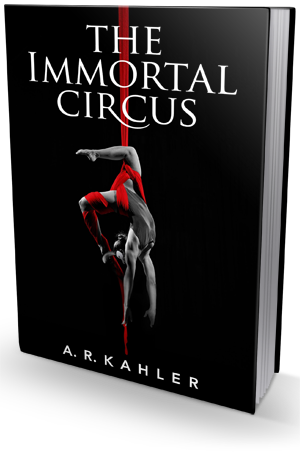 The fact that Kahler has lived among performers within a circus does help create the realism necessary for a story built on fantasy. It took me a long time to read this book. A couple weeks, actually. I just couldn't get into the story. Vivienne is a compelling narrator and the descriptions and imagery are great, but it just didn't do it for me. If you are a fan of fantasy and unique stories, I do think you should give this book a shot. It was very well written and I can see what others like about it, it just wasn't the freak show for me.